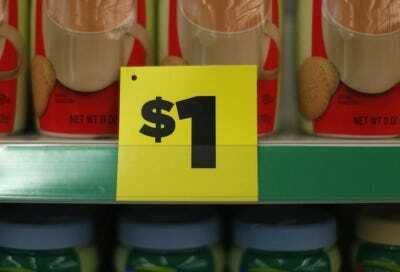 Thomson ReutersA price sign at a Dollar General store in Arvada. Dollar General Corp. may need to divest more than 4,000 stores to win approval from the US Federal Trade Commission for its acquisition of Family Dollar Stores Inc., the New York Post reported, citing two sources close to the situation. Dollar General has agreed to sell up to 1,500 stores as part of its $US9.1 billion offer. It approached Family Dollar shareholders with its offer directly in September after twice being spurned by its smaller rival. The New York Post reported on Wednesday that Dollar General could be forced either to raise its bid again or to divest more than double the number of stores previously pledged. Family Dollar said in September it had been notified by certain state attorneys general that Dollar General’s bid would be investigated over competitive concerns. Neither the FTC nor Dollar General could be reached for comment outside regular US business hours.